We’d love your help. Let us know what’s wrong with this preview of The Last Refuge by Chris Knopf. Available in Canada for the first time – a compelling debut from a fresh new voice in crime fiction. Sam Acquillo’s at the end of the line. A middle-aged corporate dropout living in his dead parents’ ramshackle cottage in the Hamptons, Sam has abandoned his friends, family and a big-time career to sit on his porch, drink vodka and stare at the Little Peconic Bay. But when the old lady next door ends up floating dead in her bathtub it seems like Sam is the only one who wonders why. Burned-out, busted up and cynical, the ex-engineer, ex-professional boxer, ex-loving father and husband finds himself uncovering secrets no one could have imagined, least of all Sam himself. Meanwhile, a procession of quirky characters intrudes on Sam’s misanthropic ways. A beautiful banker, pot-smoking lawyer, bug-eyed fisherman and gay billionaire join a full complement of cops, thugs and local luminaries in this tale of money and murder. To ask other readers questions about The Last Refuge, please sign up. This almost-four-star review has been revised and can now be found at Expendable Mudge Muses Aloud. Better copyediting! Look at the blurb above! Yeesh. For the most part I really enjoyed this debut book. The plotting was fairly well done, the setting and sense of place were quite good, and the main character was intriguing enough. I did have a few problems with the pacing and while the main character's backstory was interesting I felt it could have been condensed down just a bit. All in all though a good read and I want to continue on with the series. I really like this writer's plots, pacing, characters and setting descriptions, but, oh, the copyediting in this, his first, novel! What a mess. Hayden for Haydn, then for than, Cotswold's for Cotswolds, Maxwell Parrish for Maxfield Parrish, it's for its ... And yet the the writing in general is so literary, I can't help thinking the author was not the culprit but either someone who thought they were helping or over-reliance on a crazed spellcheck program. The previous reader of my library copy I really like this writer's plots, pacing, characters and setting descriptions, but, oh, the copyediting in this, his first, novel! What a mess. Hayden for Haydn, then for than, Cotswold's for Cotswolds, Maxwell Parrish for Maxfield Parrish, it's for its ... And yet the the writing in general is so literary, I can't help thinking the author was not the culprit but either someone who thought they were helping or over-reliance on a crazed spellcheck program. The previous reader of my library copy was frustrated enough to start penciling in corrections but gave up after a few pages. The later mysteries are better in this regard. In "The Last Refuge," we meet Sam Aquillo, former industrial designer at a high-powered corporation, who quits because his division is to be sold and his coworkers put on the street, who loses his wife and home, and whose beloved daughter objects to his suicidal drinking and walks out of his life. Sam takes up residence in a Hamptons cottage (which his roughneck father built before getting himself murdered), buys a dog and hides from the world. That is, until an elderly neighbor's death in the bathtub triggers his curiosity. He knew she never took baths but always took showers because of a bad back. A bit of a roughneck himself, having put himself through college with professional boxing winnings, Sam unravels clues his own way, enlisting wary cooperation from a local cop and a gorgeous, offbeat lawyer. 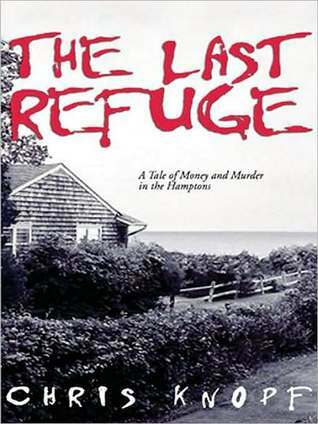 The Last Refuge- the first in Chris Knopf's Sam Acquillo - Hamptons mysteries was terrific. It had all the things I like-familiar Hamptons location,an antisocial, quirky flawed character (ala another fav-Randy Wayne White)/ ex-boxer/engineer /solver of mysteries . More quirky characters,an intelligent well thought out plot-and a little street justice for the bad guys (ala Lee Child}. Can't wait to read the second one-Two Time.Fun read and you have to love the descriptions of Little Peconic Bay. How could I resist a book set in the Hamptons, where I spent a lot of summers in my youth? Not the Hamptons you read about and see on TV, but the working class communities that were still there the last time I looked, which was several years ago. Knopf does a great job of writing a noir mystery set in an unlikely setting for such an endeavor. And his hero is an engineer--I may have to recommend this book to my father-in-law, a retired chemical engineer. This is a good read about a corporate big shot turned lazy bum who lives in a decrepit house in the Hamptons, of eastern Long Island. One day his next door neighbor is found dead in her bath tub. Authorities rule it an accidental death. But her neighbor, the aforementioned bum, is suspicious. He tries to sniff out the truth of the matter and we meet a good size number of quirky characters in his quest. It's a quick and fun read. An excellent debut introduces 52-year-old ex-engineer Sam Acquillo. When he finds his neighbor dead, he takes it upon himself to settle her estate and address the questions that come up. Acquillo is an interesting character, a loner but loyal to his friends, and aided by a wonderful dog, Eddie. Setting is extremely well done. Looks like this series has some good bones. Solid, straight-forward mystery, no tricks. I can picture the scenery; in fact that photograph of the house on the cover MUST be Sam's. His berserker behavior when settling his divorce was a riot. Warning: Disillusioned couples...nail everything down!!! Sam is a perfect drop-out, BUT Eddie, Sam's dog, steals the show. Sam Acquillo is a fifty something engineer who is living, more or less, as a recluse in the cottage that belonged to his parents. He has his dog Eddie with him and the two of them seem to be having their lives without the aid of any human contact. That is with the exception of the elderly lady who lives next door. He does odd jobs for her from time to time because his father took care of her also. This was his life for about four years until one day as he was out walking he noticed a terrible sme Sam Acquillo is a fifty something engineer who is living, more or less, as a recluse in the cottage that belonged to his parents. He has his dog Eddie with him and the two of them seem to be having their lives without the aid of any human contact. That is with the exception of the elderly lady who lives next door. He does odd jobs for her from time to time because his father took care of her also. This was his life for about four years until one day as he was out walking he noticed a terrible smell coming from her house. I am not going to say anything else, but this is a very interesting story. It goes to places that you really don't expect at all. Sam Acquillo quit his job a few years ago. His wife divorced him and Sam and his daughter have not spoken for years. He is trying to drink himself into oblivion. Then his elderly next door neighbor is found dead. Something about the circumstances of her death keep nagging at Sam. For the first time in years, Sam finds himself caring about something. I thought this was a better than average mystery. It was well written (but full of proofreading errors), with interesting characters and an involved, if somewhat unlikely, plot. The main character's situation was very much in flux as the mystery was resolved, leading me to hope there will be a sequel. I found this to be a tedious read, although I finished the book because I was reading it for a mystery book group at my public library. I found it difficult to connect with the characters or the setting and I really didn't care about the "mystery" or whether it was solved. The best thing I can say is that it was well written. A not bad at all read. The plot is a corporate crime vs. good neighbor story, with a dash of mob-like intrigue thrown in for good measure, set in Southampton, it is a battle between along time cottage neighborhood and the forces of greed. Me ha gustado la historia, cosas que ocurren en poblaciones pequeñas, las relaciones entre la gente, ver historias que se entrelazan. Se lee rápido y a la vez se aprende de los diferentes personajes. Slow starter but an excellent ending. Was hoping I’d found another author to follow, but I’m just not a fan of this style. Elmore Leonard readers would like this novel. I have mixed feelings about this one - none of which are grand and none of which are horrible. The Good: Sam IS an interesting character despite what some people might say because he is conflicted. And conflict makes me read for a resolution. The Bad: I can't be sure but I think there might have been a better way to present the conflicted Sam. More an issue of how the backstory was woven - a bit choppy, thus distracting. But I like his tormented soul an so I bore down and focused through it to l I have mixed feelings about this one - none of which are grand and none of which are horrible. The Bad: I can't be sure but I think there might have been a better way to present the conflicted Sam. More an issue of how the backstory was woven - a bit choppy, thus distracting. But I like his tormented soul an so I bore down and focused through it to learn more about what makes Sam tick. The Good: Good supporting cast of quirky characters. The Bad: Don't find it likely that they would put up with the vague Sam while he puts his case together. I think both Sullivan and Swaitkowski would have been like tell me what's the deal or I shut it down. I felt this too as many of the clues that nagged at Sam were kept to himself. If I'm reading from his POV, I need to know what he is thinking RIGHT when he thinks it. This was my biggest criticism. The Good: I thought the conclusion culminated nicely and none of the clues went unexplained or seemed forced for the sake of an explanation. I blew through the last 1/3 - 1/4 of the book as the pace really picked up and became a great mystery read. The Bad: just nitpicking: I grew a bit tired of his one liners after awhile. I think I understand that it's a defense mechanism and all but at some point SOMEONE would have punched him in the mouth - most likely his daughter. I know how she reacted but it seemed very passive in response to someone so obtuse. I really wanted Sam to have a moment of weakness where he vowed to change his ways - but even to the last page he kept his wall up. And how did the wall even get there in the first place? More Good: so glad this is a series. Sam Acquillo has much more evolving to do as a character and I am excited to read how it happens. I sense there is much of the author in this character and look forward to his storytelling to evolve as well. Book 2 in the Sam Acquillo series, here I come. I had seen this series referenced in reviews of Jon Loomis' series set in Provincetown, featuring detective Frank Coffin; although there are similarities, Acquillo's story is more gritty than Coffin's. I don't care for plot rehashes, so I'll say that Acquillo suspects a neighbor's death couldn't have been accidental (surprise: it wasn't! ), so manages to get himself appointed administrator of her estate to go nosing into the mystery of the title of her property. Along the way, we get the story of I had seen this series referenced in reviews of Jon Loomis' series set in Provincetown, featuring detective Frank Coffin; although there are similarities, Acquillo's story is more gritty than Coffin's. I don't care for plot rehashes, so I'll say that Acquillo suspects a neighbor's death couldn't have been accidental (surprise: it wasn't! ), so manages to get himself appointed administrator of her estate to go nosing into the mystery of the title of her property. Along the way, we get the story of his dad's murder, and his breakup with his wife (and daughter, by extension), both grim affairs. The father's murder is unresolved in this story, so perhaps that will be a book in itself later? Sam is very much a loner, with essentially one friend: Burt - a brilliant, rich, gay attorney. In the course of this story, he acquires another friend, eccentric local attorney Jackie Swietkowski, as well as a love interest (sort of), Amanda. He spends much time here brooding (how we, the audience, get the backstory), running around to offices to deal with paperwork and legal issues (we get a non-rich local's view of the Hamptons that way), and a couple of nasty run-ins with baddies; there are (at least) three of those with gory outcomes. Bottom line: Sam isn't the easiest guy to "like", but I ended up doing so (a trick Knopf successfully pulls off). Burt is cool and analytical, while Jackie is prone to outbursts and drama; Sam shares both traits, so the three of them should make quite a team in future books! If there's a slight negative in terms of wanting to read more, it's that I didn't get the attraction to Amanda, but I'm not wild about Coffin's girlfriend in that series either, and still like reading of his adventures. Stefan Rudnicki is a terrific choice as narrator, although he only reads the first couple of books. The plot of the story is interesting, and not frustratingly or wildly contrived. The crimes and their commission, as well as the actions taken by the main character, Sam Acquillo, make sense and seem well within the realm of possibility, unlike many current mysteries, which often strain credibility. I did wonder about the ease with which Sam is able to become administrator for his neighbour's estate however. I wasn't a big fan of Sam Acquillo, but I found him interesting enough, especially his back story, and his current situation as a middle-aged "failure". I must say that I do want to read more to see how his life unfolds in future books, and want to know more about his family, particularly his father. I have zero interest in the love angle with Amanda, and wish that authors didn't feel it is necessary to have a love interest in books that are not primarily romances. In fact, I find it a huge turn-off - just tell the damn story already. It's a pet peeve of mine. Although I must admit I'm a little intrigued to see if the lady with the prominent proboscis gets a nose job, and how that might change the dynamics of her relationship with Sam, and I do like the pot smoking lawyer. These are interesting characters in and of themselves who don't simply serve the purpose of creating sexual/romantic tension. The Last Refuge is the first of a series of mysteries about Sam Acquillo by Chris Knopf. The novels are published by a small publisher, the Permanent Press, but the author has recently been signed by St. Martin's to do a spin-off series. It's neat to know that publishing small really can lead to publishing large, but I suspect it only works if you're a good writer. Chris Knopf is clearly that. Sam Acquillo's not a particularly nice guy for a hero, not safe, not easygoing. But he already seems ver The Last Refuge is the first of a series of mysteries about Sam Acquillo by Chris Knopf. The novels are published by a small publisher, the Permanent Press, but the author has recently been signed by St. Martin's to do a spin-off series. It's neat to know that publishing small really can lead to publishing large, but I suspect it only works if you're a good writer. Chris Knopf is clearly that. Sam Acquillo's not a particularly nice guy for a hero, not safe, not easygoing. But he already seems very real to me. I trust him. At least I think I do, though I’m sure he drinks way too much. And I like him, but I’d probably not talk to him in the coffee shop. I might watch for him to appear. I’d view him with vague suspicion over my shoulder, and wonder about his past and his motives perhaps. The author does a good job of keeping the reader questioning. At first meeting Sam is kind of down-beat, kind of negative. The reader might wonder what on earth he does all day, why's he on his own, where does he get his money. He's kind, but he doesn't think of himself as kind. And he's really sort of abrasive. The book doesn't telescope any great answers, but dribbles them over conversation, keeping you off balance and looking for more. It's like slowly getting to know someone, getting used to their presence in the store, with the added bonus of an investigation that keeps growing into something more. Then you’re glad Sam’s on the case. So now I’m off to read more, still not really knowing Sam, but truly intrigued. Weird, but I could swear I've read this book before. Plot points are familiar. Did I start and not finish? The plot itself is similar to another book I read recently, There Was an Old Woman, by Hallie Ephron--old ladies in danger in a neglected neighborhood of New York. In Ephron's book, it's in the Bronx, a fictional neighborhood where the East River meets the Long Island Sound where a natural wetland with marsh and lagoons survives today In The Last Refuge, written years before Ephron's, it's a Weird, but I could swear I've read this book before. Plot points are familiar. Did I start and not finish? The plot itself is similar to another book I read recently, There Was an Old Woman, by Hallie Ephron--old ladies in danger in a neglected neighborhood of New York. In Ephron's book, it's in the Bronx, a fictional neighborhood where the East River meets the Long Island Sound where a natural wetland with marsh and lagoons survives today In The Last Refuge, written years before Ephron's, it's a down-in-the-heels corner of the Hamptons. The Last Refuge introduces Sam Acquillo, a bitter misanthrope who used to be a boxer, used to be a vice president in mechanical engineering, and used to be married. When he discovers his elderly neighbor dead in her bathtub, a couple of details bothers his orderly mind enough that he starts asking questions and finds himself in a full-blown mystery. The Last Refuge (2005) introduces Sam Acquillo, a 50-something, retired engineer, in Southampton, Long Island, New York. After Sam quits his job, his wife divorced him, his daughter stopped speaking to him, and he retreated to his parents’ old cottage on Little Peconic Bay, content to brood and drink vodka on the porch with Eddie, his canine companion. One day he realizes that his unpleasant elderly neighbor, Regina Broadhurst, hasn’t bothered him for several days. A bad smell leads Sam to her d The Last Refuge (2005) introduces Sam Acquillo, a 50-something, retired engineer, in Southampton, Long Island, New York. After Sam quits his job, his wife divorced him, his daughter stopped speaking to him, and he retreated to his parents’ old cottage on Little Peconic Bay, content to brood and drink vodka on the porch with Eddie, his canine companion. One day he realizes that his unpleasant elderly neighbor, Regina Broadhurst, hasn’t bothered him for several days. A bad smell leads Sam to her decomposing body face down in the bathtub. Sam’s engineer perspective alerts him to clues the police missed, and at local cop Joe Sullivan’s suggestion, Sam volunteers to become the executor of the estate and locate the next-of-kin. His search uncovers conflict between the local working class and the rich newcomers eager to capitalize on their investments. Sam is a prickly yet engaging protagonist, slowly reengaging with the world as he struggles to solve the mystery surrounding Regina’s death, which no one else seems to care about. Snappy dialog, a wry sense of humor, and a complex plot in a beautiful setting combine to make this debut novel something special. *** Sam Acquillo is unemployed; living on what money is left from his invention after his divorce, drinks too much and lives in a ramshackle cottage in Southampton, Long Island. He has also inherited the care of his elderly neighbor, Regina Broadhurst, and her house from his father. When Sam finds Regina dead in her bathtub he doesn’t believe it’s an accident and becomes administrator in order to investigate her death. *** I can’t blame the author for the publisher’s lack of proofreading and editing, but it did detract from the book. The story, however, I loved. This is plot-driven story that seems simple but becomes more complex as it progresses. It shows the side of Southampton not inhabited by the wealthy, but the ordinary person. Having spent time in this area, I really enjoyed the setting. I wasn’t certain I liked Sam in the beginning, but he definitely grew on me as his history was unveiled. I very much enjoyed this first book and have his second ready to read and hope there will be many more books to follow. The Last Refuge, by Chris Knopf, A. Narrated by Stefan Rodnicki, produced by Blackstone Audio, downloaded from audible.com. Sam Acquillo is burned out. He has moved into the house he inherited from his parents and has no plans to pursue anything in the future. He was a boxer, and an engineer high in his corporation. He gave it all up. Then his next-door extremely obnoxious neighbor, an old lady, ends up dead floating in her bathtub and he finds the body. The police want to write it off as acciden The Last Refuge, by Chris Knopf, A. Narrated by Stefan Rodnicki, produced by Blackstone Audio, downloaded from audible.com. Sam Acquillo is burned out. He has moved into the house he inherited from his parents and has no plans to pursue anything in the future. He was a boxer, and an engineer high in his corporation. He gave it all up. Then his next-door extremely obnoxious neighbor, an old lady, ends up dead floating in her bathtub and he finds the body. The police want to write it off as accident or suicide, but Sam isn’t so sure. The old lady hated baths and couldn’t get in or out of the tub because of arthritis, and always took showers. So why is she now dead in the bathtub? While the police don’t want to pursue it, a friendly lieutenant allows him some free rein to gather information in his role as executor of the old lady’s will. He finds that the historic Hamptons where he lives has some secrets, such as men wanting to grab up land along the ocean and develop it. And they may be willing to kill to get this land. A very good book. I’m looking forward to reading more. I can sum my opinion of this book up fairly quickly and easily. Loads of potential, with some serious holes. Now to explain that. The book was intriguing. The plot was sound, but a little transparent. The dialog was excellent. The filler was... filler. Bad, long, drawn out, makes you want to skip a few pages filler. It actually puzzled me and made me put the book down several times and just walk away. How could somebody who writes such good dialog, make the back story and some of the side informa I can sum my opinion of this book up fairly quickly and easily. Loads of potential, with some serious holes. Now to explain that. The book was intriguing. The plot was sound, but a little transparent. The dialog was excellent. The filler was... filler. Bad, long, drawn out, makes you want to skip a few pages filler. It actually puzzled me and made me put the book down several times and just walk away. How could somebody who writes such good dialog, make the back story and some of the side information so friggin drawn out that it makes the book drag? It is almost like it was written by two people. One who wrote a basic mystery story and all the dialog, and then a second person was supposed to come along and turn the short story into a novel... it was that second person that failed. No Red Herrings, no twists, no miscalculations, no surprises. Sam Acquillo lives in Southhampton, the part the summer people never see. He sits on his porch, watching the Peconic River, drinking himself to death. He punched out a lawyer at his previous job as an industrial engineer and destroyed his house while his wife and he were divorcing. Court-mandated psychological counseling did not help too much and his daughter lives in Manhattan and no longer speaks to him. He doesn't want to feel anything, anymore. Feelings get you into trouble. Sam keeps an eye Sam Acquillo lives in Southhampton, the part the summer people never see. He sits on his porch, watching the Peconic River, drinking himself to death. He punched out a lawyer at his previous job as an industrial engineer and destroyed his house while his wife and he were divorcing. Court-mandated psychological counseling did not help too much and his daughter lives in Manhattan and no longer speaks to him. He doesn't want to feel anything, anymore. Feelings get you into trouble. Sam keeps an eye on his next-door neighber and finds her dead in her bathtub one day. The only problem is, Regina has terrible arthritis and did not use the tub at all. So, why was she there? Sam uncovers a conspiracy dating back years and gets shot at and beaten up and along the way discovers he might have some feelings left over. He also finds some friends in unexpected places. I had read one of Chris Knopf's short stories (it was great), and I had heard about the Sam Acquillo series and wanted to give it a try. I really prefer to start a series at the beginning... and I am glad I did. I don't read a lot of books that I would describe as very masculine and noir-- the brooding loner, alcoholic narrator prone to getting into fights-- and at first I thought this might not be the book for me. I usually prefer a different kind of mystery. But I have to say, this TOTALLY suc I had read one of Chris Knopf's short stories (it was great), and I had heard about the Sam Acquillo series and wanted to give it a try. I really prefer to start a series at the beginning... and I am glad I did. I don't read a lot of books that I would describe as very masculine and noir-- the brooding loner, alcoholic narrator prone to getting into fights-- and at first I thought this might not be the book for me. I usually prefer a different kind of mystery. But I have to say, this TOTALLY sucked me in from the very beginning. Knopf's writing is really VERY GOOD! His characters are rich and believable. From the moment the dead body was found, I could not stop listening.